A reader of Recruiter Musings recently added the following comment: “Probably the three hardest elements of a job search are organizing your time, battling feelings of isolation and keeping up your enthusiasm as your efforts are constantly rejected or ignored.” I agree wholeheartedly with that sentiment! I’ve already addressed the issue of organizing your time in great detail in a prior blog posting. [Read “Time Management: Recipe for a Well-Balanced Job Search” for more details on that topic.] Battling feelings of isolation and keeping up your enthusiasm in the face of rejection are topics that are very much connected to each other … and I thought they deserved a more thorough treatment here. Being rejected or ignored is a regular part of the job-seeking routine. It’s the nature of the beast. Sales people may be used to facing rejection on a daily basis … but most others are not. Emotionally, that can take a huge toll on a person’s attitude, which is a big problem when maintaining a positive attitude is so critical to a job-seeker’s chances of success. [Read “The Power of a Positive Attitude.”] Professional sales people do not fear rejection, nor do they take it personally. They simply plow forward, knowing that the more times they hear “no,” the closer they are to a “yes.” However, I realize that job-seekers are not all professional sales people, and rejection is much harder for some to handle than others. In addition, job-seeking can often be a very lonely experience. It’s often said that looking for a job is itself a full-time job. That job is much like being self-employed and/or working from home, which is a situation that invites feelings of isolation. Job-seekers spend a great deal of time alone – in front of their computers, researching companies, searching for job leads, trying to figure out who to contact for networking, etc. That isolation combined with the repeated pattern of rejection can be a real “Double-Whammy” … and a very tough combination for many job-seekers to overcome. While there is no magic pill that will turn a negative attitude into a positive one, or permanently cure loneliness … there are many things a person can do to help break out of the isolation and negative patterns of job-seeking routines. Most of these ideas have the same, simple and obvious purpose – they are designed to get you up and out of the house, and interacting with other live people. Putting meaningful, job-search related appointments on your calendar, getting dressed up and out of the house, and meeting with other people does wonders for the psyche! Being out of work provides you, for better or worse, with an abundance of extra time on your hands. Consider expanding your knowledge and skills during your time off by taking a class or two. Public libraries and local community centers have many such classes that are often totally free, or very inexpensive. Government subsidies are also available to help pay for many other programs and courses – often of a technical nature – designed to “re-train” people by expanding their skill sets and make them more marketable. Besides acquiring new skills, taking classes gives you a sense of purpose … and also affords you opportunities to meet more new people! Many job-seekers turn to volunteer work as a way of staying busy and feeling useful while unemployed. Besides the obvious personal benefits that come from the act of giving of yourself, sharing your time, helping others and upping your “karma” score, volunteering can often get your “foot in the door” with a company that might potentially hire you in the future. Showing people what you can do, how well you can do it, and demonstrating your exceptional work ethic – even if it’s not in a paid position – can bring you to the attention of professionals who notice such things, and reward them when opportunities open up. And again, it surrounds you with new people that you can interact and network with. You simply never know who you’ll meet – and who those people may know – until you put yourself out there! Hopefully, you’ll see a theme emerging here. It’s all about people contact – both on the phone, and (more importantly) in person. The more people you meet and network with, the less likely it is that you’ll feel isolated and alone, and the more your attitude will improve. 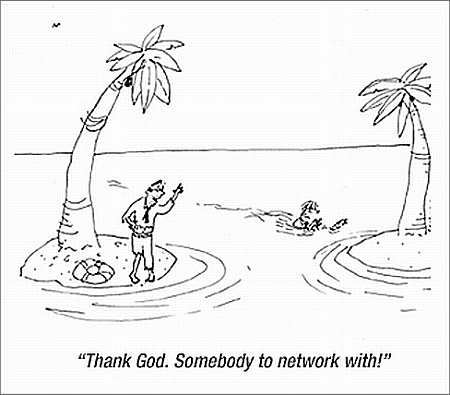 I’ve said it before, and I’ll say it again here: Networking is the best way to spend your time as a job-seeker. [Read “How to Network: A Step-by-Step Guide for Job Searching” for more details on the mechanics of networking your way to a job.] The more meetings you set up, and the more live conversations you have, the closer you’ll be to hearing that illusive “yes,” which is your ultimate goal! Entry filed under: Advice for Job Seekers. Tags: job-seekers, networking, time-management, unemployment. This is the most important information job seekers need to understand. Sadly, many of them do not! Michael makes a valid point in that it’s tough to maintain a positive attitude in a negative situation. Here is a rather simple tip, a process really, that might be useful. When you feel down, ask yourself to describe your mood level. Honestly describe it completely and fully, and continue to ask and answer that question repeatedly until you feel a little better at which point end off. Keep in mind that a mood is just a mood, it is not you. A negative or down mood tends to fix a person in an unwanted position or attitude, and it is from this attitude that we try to get things done. One more thing: a mood that becomes fixed and won’t “lift,” is being held in place by unwanted emotions such as anger, frustration, resentment, etc. It is these emotions that act as glue to hold the mood in place. By asking the question above, you have to begin to separate yourself from the mood by “pushing” it away from you so that you can describe it. The more distance you can get between you and the mood / emotion(s), will eventually cause it to dissipate to some degree. Great article, Michael. As a home-based company owner, I know too well how important it is to get out. One thing I would add to your article is to not spend too much time networking within your own professional organizations. While I’ve occasionally received referrals from colleagues, the most leads come from attending meetings of associations in other industries. I’ve found that pushing the comfort zone reaps rewards. Thanks again for a good article. I couldn’t agree with you more Michael! I am in sales and related fields, and it is more comfortable for me to meet with strangers and network than it is for some folks. Unfortunately, I think oftentimes, people believe if a meeting does not involve a potential job or job lead, it’s not worth their time. That’s not how networking works. It’s all about “who knows you” and the only way to increase that knowledge with others is to make those connections. It’s like learning about a great new restaurant and you want everyone to try it because you enjoyed it so much. You pass on that recommendation to everyone you know because you want others to enjoy it as well. When you meet an impressive person in business or otherwise, you will tend to speak about them more than you would others. Here’s to increasing our meaningful networks! I am in this very predicament, and this article is right on the money! My leads have dried up and I’m now in the process of networking to generate more leads. Your tips for targeting key people will be very helpful to me. Your article is right on the money. I have been unemployed for six weeks now and one of the first things I did was join a networking group. We meet every Thursday morning for 3 1/2 hours sharing leads, helping each other with the job search, etc. It is truly beneficial for the psyche. One other thing I would like to mention is a supportive spouse. It really does make a difference and I’m grateful everyday for mine. Thank you again for the article. I enjoyed reading the article and couldn’t agree more with the recommendations. I chose to take classes at the Community College which not only has enhanced my skills, but gives me a restored sense of pride and confidence. It’s also another way to network with people that are utilizing these new found skills, and it helps to know that others are facing the same challenges as you being that many are there for the same reasons. I now also try to attend many of the functions that I’m invited to as a way of gaining more up to date information and knowledge. Networking is certainly something that’s a learned art and I have never been very comfortable putting myself out there; but it is becoming easier and opens the door to more serendipitous opportunities. By the way, just read a great article in Psychology Today on Serendipity, which I would definitely recommend to lift one’s spirits and morale, and has similar recommendations. But on the flip side to this process, a good professional sales person knows how to get through to the “gate keeper”; they know how plan their work and how to work their plan. The bottom line to this response to your comment is: Professional Salespeople still have feelings, we just know how to apply the Skin-Thickener better. Of course salespeople have feelings – I never meant to imply otherwise. However, my point was that since they face rejection every day as part of the sales process – and are trained to cope with it and persevere in spite of it – I feel they are better equipped to handle the emotional fallout than a non-salesperson. Overcoming objections and getting past gatekeepers are identical scenarios for both salespeople and job-seekers. Also, both salespeople and job-seekers sometimes encounter situations where there simply is no “next step” and they just have to move on to the next prospect. Both have to learn to deal with such rejections as best as they can emotionally. Good article,except it’s a “triple whammy” in my opinion, the third factor being “lack of money” ! Hi, i completely agree with what you have said. I am in the midst of the same emotional crisis. i am dissatisfied with my job and have also been denied promotion becuase i became a mother and the company feels that my output would go down because of my personal priorities . I feel so low these days. neither i am able to concentrate on my job nor able to attend to familiy responsibilities. I try to motivate myself but my spirit goes down every other day. Its such a big challenge to keep up the morale in troubling times. Michael, You got it. stay involved. Let one path lead to the next. You never know which avenue is the one that gets you the result you hope for.